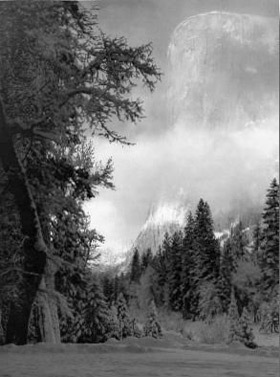 Ansel Adams is probably best known for his images taken in the Yosemite National Park, California. This is a collection of three of his best loved images printed together on a single picture. Between them they cover 41 years of his incredibly productive career. 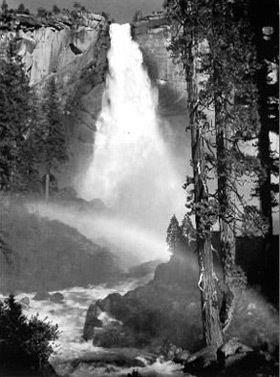 Yosemite had a special place in Adams affections, he was to visit the park every year of his life from his first visit aged 14 in 1916. Larger images of the three are shown to the left and they can be purchased as separate prints in their own right if preferred by clicking on the images to the left. He positioned himself at one of the classic El Capitan viewpoints, from where the full 3000 feet of the cliff was visible. He set up his tripod in deep snow taking care to securely push each of the legs down to a stable layer below so that settlement didn't cause any movement. A particular feature of the scene that Adams wanted to capture was the swirling cloud passing above the trees and in front of the cliff, for all his visualization experience (this picture was taken 41 years after his first successful application of the technique) the behaviour of such cloud was unpredictable. This pictures was taken on a spring day around 1947 - though he was very meticulous with photographic detail and could remember details of exposures and development, Ansel Adams was not so good when it came to remembering the dates of his pictures - even to the year! His8 x 10 inch view camera, two lenses, filters and six double film holders, along with the necessary tripod to set out to photograph Nevada Fall had been packed. The fall was in full spate at that time of the year, carrying the melt-waters from the winter snows, in particular the subject was to be the rainbow formed from the mist in front of the fall. When all was arranged on the ground, the sun still had to move around to the ideal position and so he waited patiently. There would not be much time to get the picture he had visualized as shortly after it was in position, the sun would disappear over a ridge. It is easy for those who are simply the observers of pictures, (rather than the creators) whether of art or not to be ignorant of the difficulties, subtleties and efforts that go into producing photographs like those of Ansel Adams. Perhaps it is a reinforcement of the skill and dexterity with his medium that the observer of Adams pictures can see the image and imagine themselves in the picture possibly producing the same image themselves. That very few have ever matched the standard of these photographs let alone surpassed them is indication that his photographs are far more than just being of "...a bit of scenery". This was the first widely recognized and acclaimed picture that Ansel Adams produced. It was this image that really showed the world the future potential that Adams had. It was taken on April the 17th in 1927 on a day when Adams was climbing and taking photographs with his then fiancee Virginia Best and two friends Charlie Michael and Arnold Williams. He was 25 at the time, and laden with his 6 1/2 x 8 1/2 inch Korona view camera with two lenses, two filters, a wooden tripod and twelve glass plates that were his negatives. 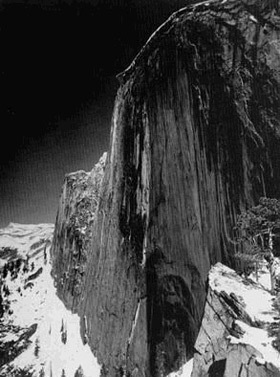 Adams had already exposed ten of his twelve plates with varying degrees of success before he turned to the face of Half Dome. He arrived in position at about noon when the subject was in full shadow and so waited until "early mid-afternoon" when the sun began creeping up on the scene before setting himself up to take the photograph. The picture is significant in that it represents Adams very first conscious "visualization "of the final image as it would appear with the filter in place. This was a technique that was to become more and more important over the years as he became more competent with increased experience at applying the technique. The excitement of seeing this, the first visualization come true when removed it from the fixing bath was described as "..one of the most exciting moments of my photographic career."